Untreated sleep apnea leads to congestive heart failure, so if you are at high risk for sleep apnea, contact Soft Touch Dentistry's 24 hour line at (618) 622-5050 to schedule a consult. You may be a candidate for a special apnea mouthguard that can be used at bedtime, as an alternative to a CPAP machine. For a trusted dentist who is qualified to provide sleep apnea treatment, choose Soft Touch Dentistry. We are a family dental practice that provides state-of-the-art general, restorative and cosmetic dental care in a caring, stress-free environment. When it comes to treating your sleep apnea, Dr. Thompson provides oral appliance therapy that can help you reclaim a peaceful and restful sleep and improve your overall health and quality of life. You will find that our practice makes your comfort a priority from the moment you walk in our doors. We offer relaxing amenities as well as chair side patient education videos to keep you comfortable and well informed of your upcoming dental services. If you suffer from sleep apnea, let our experienced dentist help you today. We make it our mission to use the latest dental technology and cutting-edge technique to help patients gain their best smile possible. Obstructive sleep apnea and snoring can have a significant impact on your overall health and quality of life. It is a common condition that involves one or more pauses in breathing or shallow breathing while you sleep. When it comes to treating this chronic sleep disorder, Dr. Thompson will work collaboratively with your physician and perform a careful evaluation of your symptoms and medical history before recommending a custom oral appliance. 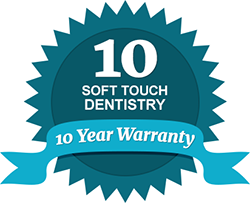 At Soft Touch Dentistry, our custom appliances are made from the highest quality material and they are precisely fit for your comfort. Sleep apnea appliances are titrated by the patient to provide maximum medical improvement over a four to six month period. Dr. Thompson will monitor your sleep apnea treatment and make sure it is providing an improved night’s sleep and helping you regain the quality of life you deserve. If you or someone you know suffers from disruptive sleep due to snoring and other sleep apnea symptoms, contact our dental practice today. Our dentist and team of dental support professionals are highly trained, personable and ready to educate you on the benefits of letting your dentist treat your sleep apnea. Our practice serves patients of all ages and we welcome the opportunity to care for your smile. Soft Touch Dentistry accepts most dental insurance providers and we offer flexible financing plans for your benefit.